A skilled and qualified job applicant like you deserves a creatively designed resume. Don’t just settle for words and credentials to land you the position because you need to make a good first impression for them to notice you. 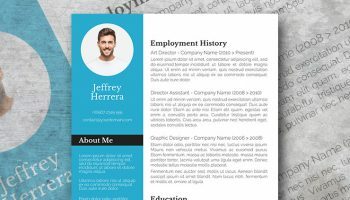 Using this free smart resume template, you can make your self-marketing document more presentable to employers and earn a call-back for the job interview! Download the file now and make an impact to recruiters! Need a 2-page resume, a matching cover letter? We got you covered with the complete set that also includes a job interview tracker. Get the complete pack here. Freesumes is a leading provider of free resume templates that you can download and tailor to your own needs using Microsoft Word. If you don’t have this software installed on your computer or don’t feel proficient enough with it, you might want to check this online resume builder alternative. The nice little icons show up as red blocks after downloading! Why is that? Hi Will, depending on the Word version, you might first need to disable the color overlay. To do so, just right click on the icon, select “Format AutoShape”, then set “No Color” for both the Fill Color and the Line Color. Tried your troubleshooting but it was already set on no Fill or Line colors. Any other tips to get it to show up correctly? Once the font is installed, just copy the icon you want from here: http://fontawesome.io/cheatsheet/ and paste it directly into your resume. Hi, thanks for sharing the resume sample. i want to extend my resume (for eg: to add personal data, extra curricular and skills) and for that i need those little icons. can you please help me out. Hi, the template looks great on my PC but when I email it as an attachment, it’s showing up to everyone else all jumbled. – Is there a way to correct this issue? Thanks. Hi Amy, thank you for reaching out. I would recommend to save your resume as a PDF file once you have finished editing it. This way, the fonts will be embedded into the document and the person you sent it to will see it the same way as you do. Wheneve I click on anything it opens other ads , which icon is it? When I open the document, the fonts are different than the ones shown in the picture above, Is there any way that I can change this? Or if you know the name of the different fonts,, that could help too. Thanks! Hi Cheyenne, sure, the fonts used are listed in the documentation included in the zip file you have downloaded. Be sure to install the fonts before opening the resume template and they will show up properly. Will this work with Open Office at all? Hi, you might seek for FontAwesome online documentation for the implementation in Photoshop, good luck! Hi Alex, the download button is locked by default. Be sure to use one of the social share buttons at the bottom of the post to reveal the button. I shared the link, but it still not available for download. Could you help me? Thanks! Hello Jadh, please understand that posting or liking directly on social media networks will not unlock the download. Instead please make sure to use one of the social share buttons at the bottom of the post (the box with the like, tweet and +1 us) to reveal the button. It says the,”resume template is for subscribers only.” I subscribed but I couldn’t download the template. Hi Lyn, this resume template is indeed for subscribers only. Please note that you must first confirm your subscription by clicking on the confirmation link you have received via email. Feel free to reach out directly via the contact form with any question you may have. LOVE the template, but having issues adding work experience. I’m able to edit the first three entries, but can’t seem to figure out how to add additional work experience. Cut and paste doesn’t seem to work for me. Any tips? Thanks again for the free template! You’re very welcome, I’m glad you like it! 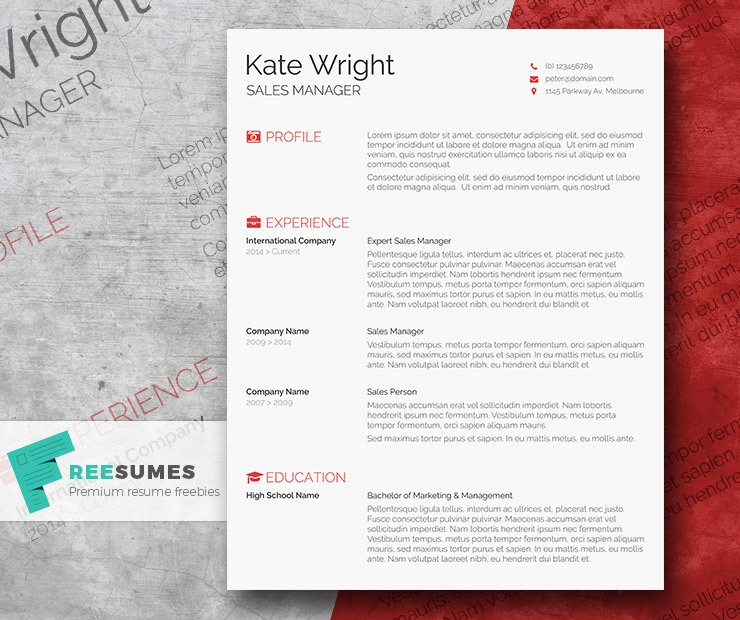 Regarding your question, each element on the resume has been designed in separate text boxes. To duplicate a paragraph for example, click on it, then click on the border that appears. You will then be able to copy it. Click outside the paragraph and paste. Is there any way to change the color of the icons? Hi, the template has recently been updated. The icons are in fact a font so you can definitely change their colors as long as you install the fonts listed in the documentation. Loved the template. Took sometime to figure out installing the font to get the icons. your comments were helpful. Now i’m having issues with adding a line under the address. How do I add a new text box? Copy-paste doesn’t work. Go to the “Insert” tab, click on “Text Box” and then on “Draw Text Box”. Just click on the document where you want to place your text and type your text. Hi, I have installed the 3 fonts in the use-on-desktop folder and tried each, but the icons just show as rectangles. Hi Tam, for your information the font used for the icons is called FontAwesome. Please note that you must install the fonts before opening the template otherwise MS Word will replace them with your default system fonts. How do you install the fonts from the zip file(s)? When you extract, do you have to move it to MS Word? If so, how? Sorry, I’m a bit of an amateur! Regarding your question, you don’t have to move them to MS Word. Once you have downloaded the fonts, you will first need to extract them if they come in a zip file. To install a font, depending on your OS and if you’re working with a PC or a Mac, the process might be a bit different. On some case, all you’ll have to do is to make a right mouse click and then to click on “Install”. I’m still really struggling to get this resume to work as it should, including the icons. I have downloaded and installed both the Raleway and FontAwesome font. However, when I copy the icon code from the ‘Cheatsheet’, no icon appears, simply the code I copied does. Can you please assist? Otherwise I will simply resort to another resume template that is less difficult. Hi, please note that the fonts must be installed before opening the template. I would recommend to download the template again and start working on a fresh copy. If this solution still doesn’t work for you, open the template and make sure that the current font in the font selector is indeed FontAwesome before pasting the icon from the ‘Cheatsheet’. By the way, you need to copy the icon, not the code. Feel free to reach out directly via the contact form if you have questions. Hi Shehab, it seems that you have already confirmed your email, please try to refresh the page, the download button should appear. Feel free to reach out directly via the contact form if there is still any concern. Thank you. I subscribed but don’t see the email to confirm in my inbox. Hi Sara, the email might have ended up within the spam folder of your mailbox so you might want to check there. Feel free to contact us directly if you can’t see it. Thank you so much for this beautiful template. However I am having trouble with the fonts. I can only see checkbox. I have downloaded the font awesome zip file. Installed regular and all. When I try to copy from cheatsheet, its still coming checkbox. I really dont know what I am doing wrong here. Hi Navi, make sure to install the fonts before opening the template. I would recommend to download the template again and start working on a fresh copy. If this solution still doesn’t work for you, open the template and make sure that the current font in the font selector is indeed FontAwesome before pasting the icon from the ‘Cheatsheet’. 1. Download Font Awesome zip from site and in a folder there should be a font called “Font Awesome 5 Free Solid”. Install this. 5. In the “find what” box type “^?” then click “more>>” and select “any character” in the “special” dropdown. 6. All the text in every text box should be highlighted now. Change the font to “Font Awesome 5 Free Solid” and your document should look perfect. Hope this helps anyone else. this is how i fixed mine. Hi Henry, thank you very much for taking the time to give this valuable feedback and help others with your step-by-step instructions. Why would anyone want to use obscure fonts (for icons no less) not knowing if the recruiter will even have the same fonts installed? I have downloaded and installed all the fonts and the icons and tried all the above methods but the fonts and icons that appear on my document are still not the same as the one shown in your preview and the icons are still the question mark blocks, help! Hi Charmaine, it seems like the font library for the icons has been updated to a newer version, you can download it here. Once installed, I suggest to start with a fresh copy of the template. If you have additional questions, feel free to reach out directly via the contact form. This doesn’t look good in Office 2019. Hi Jim, be sure to install the fonts mentioned in the documentation before opening the template. If the template still doesn’t look right when you open it, you might need to click on the “Enable editing” button at the top of the screen. Feel free to reach out directly via the contact form if you have questions.